So, yesterday I was sick and spent the day at home resting up, staying hydrated, and catching up on all my DVR shows. I finally got to watch Sunday night's episode of AMC's "The Walking Dead" (my favorite show), and boy oh boy.. was that one hell of a twist at the end!!! My God this show is so freaking good. 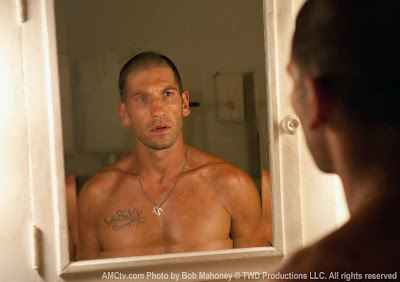 I don't want to give anything away, but I did want to take a moment of silence out for bad boy Shane Walsh's body!! Yowzers... He hopped out the shower, shaved that head, and I was in love. He's technically not a "thick neck," but those traps (and abs) do make my heart skip a beat. I wish the camera panned down and showed the rest of his delightful body. It's truly delectable. As for the rest of the episode, I'm continuing to love the performance of this ensemble cast. It's giving me tinges of nostalgia for how Grey's Anatomy used to be before Burke left... I love this cast! I still think Dale is annoyingly overprotective of Andrea (if she wants to off herself let her...) and I'm a little smitten with Daryl. With his racist brother gone (though I heard he's coming back this season possibly), I think he's having a chance to spread his wings and find his place in the group. T-Dog I'm on the fence about... maybe because his name is "T-Dog" lol... Glenn should have more lines, but I wonder if a relationship will grow between him and that new girl (forgot her name). I'm hoping that Carol's daugher Sophia doesn't come back... I even wished for Carl to not make it lol... I think the kids slow the group down. Is anyone else watching? This show is pretty much the most amazeballs thing on TV right now.